Apple’s iOS 10 update is finally here! Apple shared advanced versions of its newest system update with developers months ago, but now it’s your turn to try out iOS 10 on your iPhone and iPad! iOS 10 will now give you access to the Universal Clipboard, a feature that allows users who have both an iOS 10 device and a macOS Sierra device to copy and paste documents, text, images, videos, and much more across connected Apple devices! With iOS 10’s Universal Clipboard, users can copy a password, their credit card information, and a saved ID number from Dashlane on their iPhone and paste it directly into a website’s form field on their Mac. Now, your iPhone just became your brand-new password remote! And don’t worry about your copied passwords being stored on iCloud or on Apple’s servers–your copied passwords will be encrypted end-to-end. Open your passwords in a clear and easy-to-read format using 3D touch in Dashlane! Use 3D touch on a hidden password in your iPhone or iPad app to display it in a large character view. From the home screen, you can also use 3D touch with Dashlane to access shortcuts that will allow you to quickly search for a credential, add a password, or share Dashlane with someone who could use a hand remembering all of their passwords. You can get even more out of Dashlane from your iPhone and iPad’s Spotlight Search. From the search bar, you can find a stored password, your credit card information, or a secured note in Dashlane. You can even call phone numbers stored in Dashlane directly from the search results. One of the smartest ways in which Dashlane can work with your iPhone and iPad behind the scenes is through Proactive Suggestions. We’ve made item types like addresses and phone numbers securely accessible to make handy suggestions as to when you may want to use them. For example, if you’ve recently viewed an address in Dashlane, your device can suggest looking up directions within one of your GPS apps. Or, if you’re using iMessenger to make plans with a friend, just type “let’s meet at” and you’ll get a prompt to fill in one of your Dashlane addresses. No more bouncing back and forth between apps! Dashlane and your iOS device are doing the hard work for you. What’s Else is New in iOS 10? Following the success of messaging platforms like Facebook Messenger and Snapchat, the iOS 10 update significantly revamps iMessages to take your conversations to a whole new level of fun. If you’re a fan of sending stickers, GIFs, and hilarious emojis, users can now access third-party apps from the iMessage App drawer next to the text field on your iPhone or iPad! 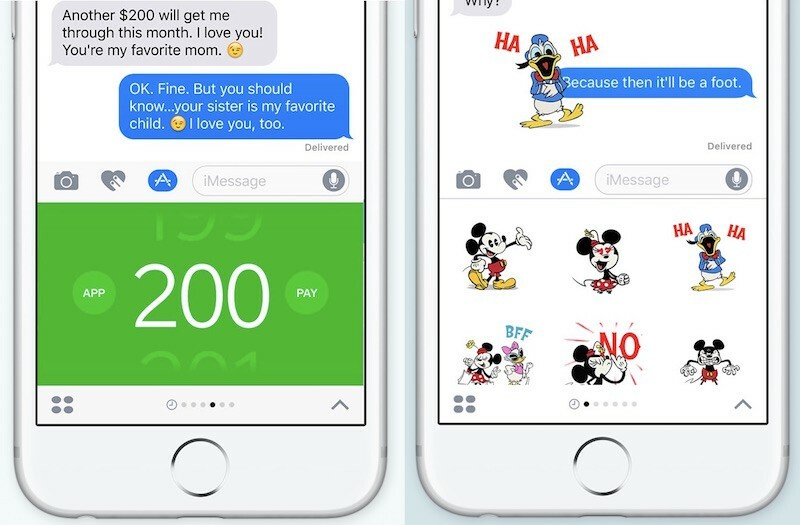 That means you can send a GIF from JibJab, send animated stickers instead of static emojis, pay friends with Square Cash, or order lunch with DoorDash–all without leaving the iMessage app. Even text bubbles are now animated! With iOS 10 bubble effects, users can make text bubbles slam, loud, gentle, or invisible. Say “Happy Birthday” or celebrate a special occasion with balloons, fireworks, confetti, shooting stars, or other animations that take over the screen. iOS 10 makes QuickType smarter thanks to “Siri Intelligence”– a feature that can analyze content that your type or search for, and offer smart recommendations based on your query. For example, if someone texts you asking, “Where are you?”, QuickType recommends sharing your current location. Based on context clues, QuickType can also recommend times that are free on your calendar, pull up contact information stored on your device, and can look up things, like places and movies. Siri got a serious makeover for the iOS 10 update–and it’s wicked good! Apple has opened up Siri to third-party app developers, meaning you can now open Facebook, order an Uber, or send a WeChat message (and of course, items stored in Dashlane) using Siri on your iPhone or iPad! Siri is also your new virtual assistant on Mac devices! From the menu bar, you can ask Siri to message a contact, look up movie times, or search for specific files saved on your computer. If you get a breach alert from Dashlane, but don’t have the time to change your credential at that moment, tell Siri “Remind me of this” to set a reminder to change your credentials later in Dashlane! Apple expanded support for 3D touch to help you accomplish tasks with your iPhone 6 or iPhone 7 device faster and easier. For example, iOS 10 allows users to use 3D touch with incoming notifications on the lock screen to quickly peek at videos, photos, and respond to messages. Apps in the Control Center will also support 3D touch, meaning you can change the intensity of the Flashlight, pre-set intervals with the Timer, bring up Camera options, and copy the last result from the Calculator. What’s the point of amazing features if they don’t protect your data and privacy? Following public debates and a battle with the Federal Bureau of Investigations (FBI) over encryption and user privacy, Apple has strengthened its commitment to protecting users in this update. According to AppleInsider, Apple is investing in a security technique dubbed differential privacy–”a means of maximizing the accuracy of queries from statistical databases while at the same time minimizing the chances of identifying specific individuals.” On the backend, Apple combines a mix of security techniques, such as hashing, noise injection, and subsampling, as well as end-to-end encryption. In other words, you’ll still have the best possible security standards protecting the data stored on your iPhone or iPad. iOS 10 also allows users to adjust specific settings to protect their privacy and data. For example, users can remove data-leaking widgets, notifications, and app shortcuts from the lock screen, disable the Frequent Locations feature, which tracks the recent places you’ve been, and enable the Erase Data feature to wipe the data from your device after 10 failed login attempts. Needless to say, iOS 10’s efforts towards improving user security gets our stamp of approval. These are only a few of our favorite iOS 10 enhancements, but I’d love to hear your thoughts in our short poll below! What is your favorite feature on Apple’s iOS 10 Update? iMessage with stickers, emojis, and third-party apps.